Put your head under water near a coral reef or an oyster bed, said Ashlee Lillis, and you’ll likely hear a strange crackling sound. 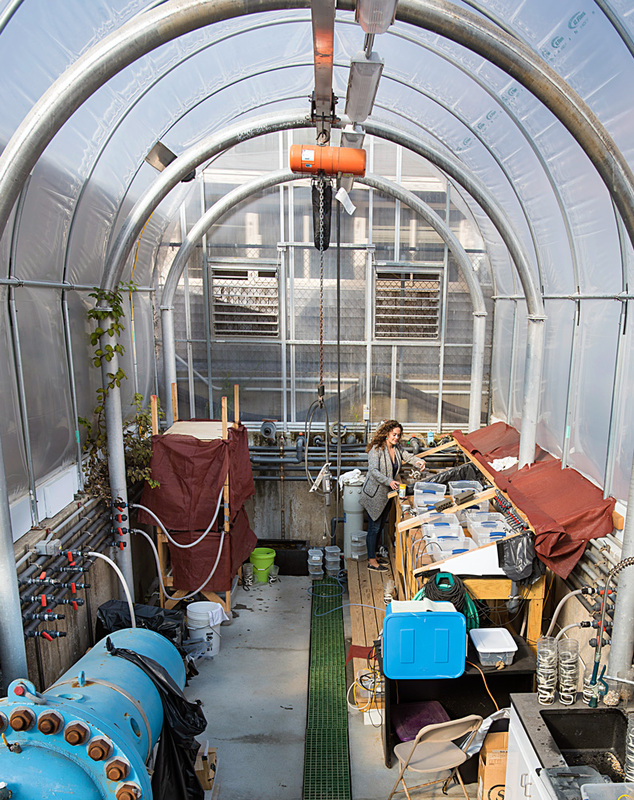 Lillis is a benthic ecologist, meaning she studies animals that live on the seafloor. For a long time, Lillis said, no one really knew what that cracking noise was, or where it came from. “It was attributed to all sorts of things,” Lillis said. Sailors thought they were hearing crashing surf, underwater volcanoes, pebbles moving on the sea bottom, or even shipworms gnawing on the wooden hulls of their ships. In World War II, the ubiquitous crackling sound started interfering with the sonar the U.S. military used to detect enemy submarines. The Navy needed to know where the noise was was coming from, so they called in researchers from the University of California Division of War Research, who discovered its source: dense communities of tiny snapping shrimp. The Navy even put their snapping on a training record, to help the sonar operators recognize the shrimp when they heard them. What’s amazing, Lillis said, is how such small animals make such a big sound. Snapping shrimp are smaller than your thumb, and they look like a tiny lobster, with two front claws, one much bigger than the other. “They have one special snapping claw that is usually at least half the size of their body,” Lillis said. Snapping shrimp, or pistol shrimp, as they’re sometimes called, use that supersized appendage to make their distinctive sound. But they do it in a surprising way. “The shrimp open their claw really, really wide,” Lillis said. When they snap it shut again, the force spurts out a jet of water, going as fast as 60 miles an hour. A void forms behind the jet, creating a bubble—it’s called a cavitation bubble. It grows and grows, until suddenly: boom! The bubble collapses, producing the shrimp’s signature snap. One snap can be as loud as 220 decibels—much louder than a gunshot. It doesn’t sound that loud to us, because it only lasts about one ten-thousandth of a second. The underwater crackling divers and sailors can hear is the sound of hundreds of shrimp snapping at the same time. 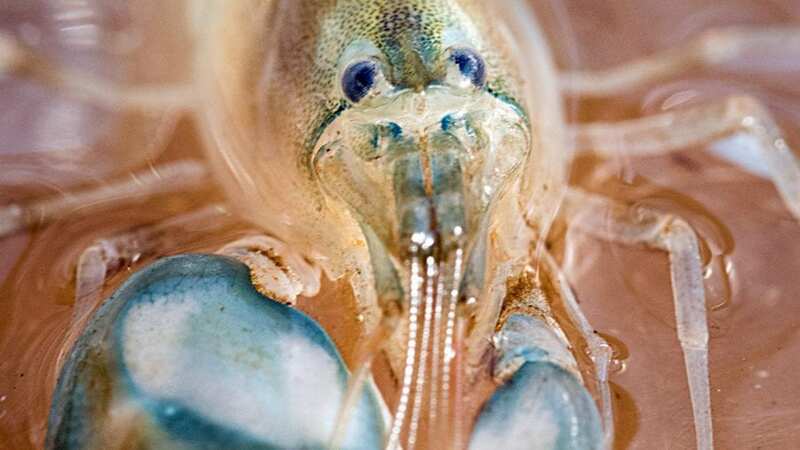 “They live in such dense aggregations that, even though an individual shrimp may not snap that much, there’s a pretty much constant background noise of these shrimp snapping,” Lillis said. 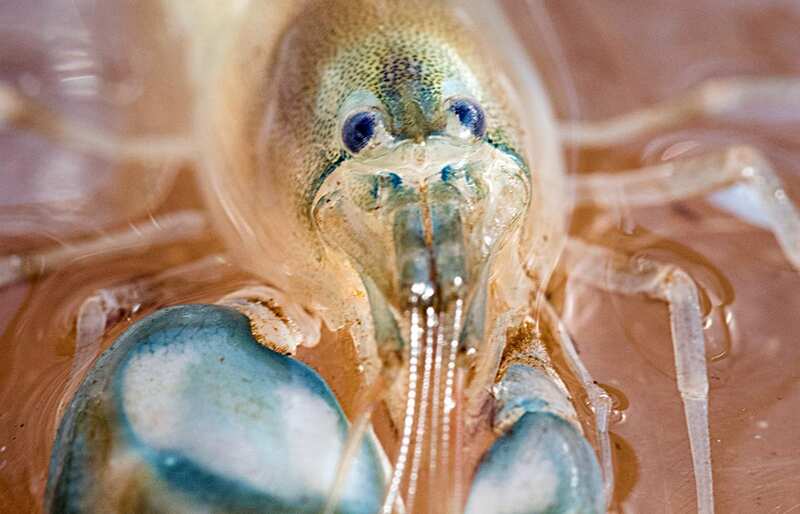 There are all kinds of theories about why snapping shrimp snap. They might do it to defend territory, to stun their prey, even to attract mates. But whatever the reasons, their snapping dominates the underwater soundscape in many coastal areas. As a result, Lillis said, these little shrimp could have an outsized effect on other marine life in their acoustic environment. “There is evidence that the soundscape—this combination of sounds associated with, say, a coral reef—is really important for navigation and orientation by larval fish and invertebrates all the way up to adults,” she said. In other words, the snapping could be a kind of sonic landmark, helping other animals find their way. Conversely, Lillis said, the shrimp’s chatter could interfere with acoustic communication in other species—as it did with military sonar. 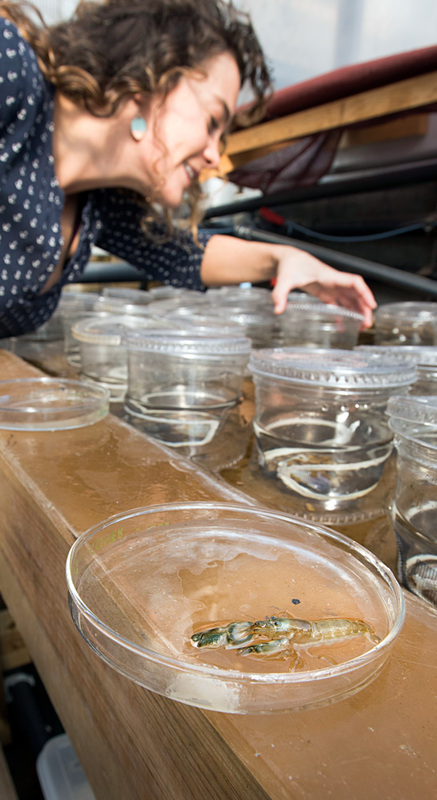 In her research, Lillis is looking into the shrimp’s impact on soundscapes. And she’s trying to find patterns in their snapping behavior, to understand how and why it varies with location, time of day, water temperature, and other factors, such as whether other shrimp are nearby. 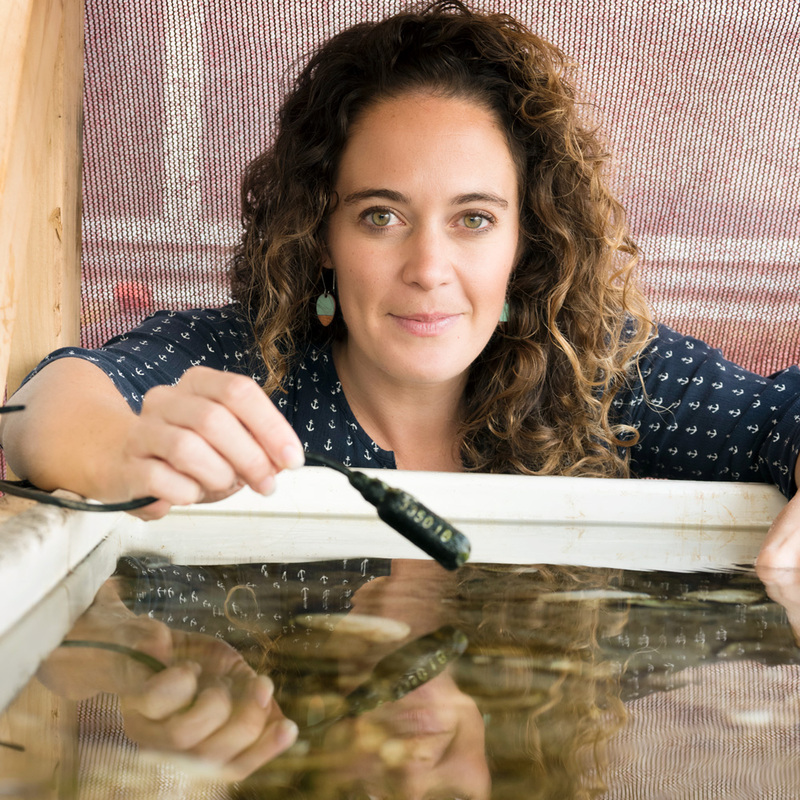 Funding for this research was provided by the Woods Hole Oceanographic Institution Ocean Life Institute and Coastal Ocean Institute through the WHOI Postdoctoral Scholar program. Additional support came from NSF Bio-OCE 1536782.